My short essay from the CD booklet of Russian Album (Mussorgsky, Tchaikovsky / Agata Schmidt, Bartłomiej Wezner) – just released by Academy of Music Feliks Nowowiejski in Bydgoszcz. On the surface, they had nothing in common. Modest Mussorgsky came from the unruly boyar aristocracy, descendants of the Rurik dynasty whose knyazes (princes) gave birth to Kievian Rus’ and ruled the Grand Duchy of Moscow until the beginning of the 17th century. In keeping with the family tradition, Modest took up military career in the famous Preobrazhensky Regiment, a breeding ground for the command elite of the tsar’s army. He was excellent on the piano (he began to learn at the age of six, under his mother’s guidance), but as a composer he was self-taught. He got his first experience in the field in the cadet school, where he would entertain his peers by playing at dances – mixing lively polkas and sweeping waltzes with his own piano improvisations. While serving at the St. Petersburg military hospital, the seventeen-year-old Mussorgsky met Alexander Borodin, five years his senior. Thus began his association with the Mighty Handful, a group of composers inspired by the operatic heritage of Glinka and Dargomyzhsky, who with time would contribute to the consolidation of the Russian national school in music. Mussorgsky quit the army, joined the civil service, made some extra money as an improviser and accompanist, but, above all, he composed. He wrote music which his contemporaries found strange – seemingly romantic in spirit and seemingly deeply rooted in Russian folklore, yet shocking in its innovative use of technical devices which in many respects were ahead of the achievements of the French composers from the turn of the 20th century. Over the years Mussorgsky’s chaotic oeuvre turned out to be the most complete embodiment of the ideas of the Handful, although its other members – including Rimsky-Korsakov – regarded him as somewhat of a dilettante. Tchaikovsky photographed probably by Władysław Pachulski in 1890. Pyotr Tchaikovsky was born in a family of well-to-do, though still modest, tsarist officials. Ever since his great-grandfather, the Cossack Fyodor Chaika, distinguished himself in the Battle of Poltava, successive generations of Tchaikovskys had dutifully entered into the service of the Empire. Pyotr’s education followed a well-established model of the day: first piano lessons at the age of five, boarding school started at the age of eight and then law school at the university. Tchaikovsky began to study music regularly, under Anton Rubinstein, only after he turned twenty, enrolling in the newly opened St. Petersburg Conservatory one year later. Soon after he made the brave decision to commit himself wholly to music. He graduated with honours and practically right away started teaching at the conservatory. He was in touch with members of the Mighty Handful, although their ideals were completely alien to him. He felt stifled in Russia and travelled extensively, also overseas. It was his ambition to write music that would preserve the features of the Russian style, yet so perfect technically that it would be appreciated by the fastidious Western audiences. Essentially, he was an academic – in contrast to the composers of the Handful, none of whom received regular conservatory education. 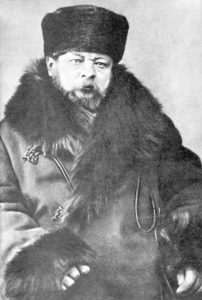 He referred to Mussorgsky as a “hopeless case”, a man whose great talent was equal only to his narrow mind, completely devoid of aspiration and a desire to develop. He failed to see Modest’s work as an expression of rebellion against the fossilized status quo. Mussorgsky, on the other hand, could not understand that Tchaikovsky’s cosmopolitanism was a sign that he did not belong to any group. And yet the West would come to love both of them and consider their oeuvres as a distinct reflection of the mythical “Russian soul”. Where does this strange affinity between two extremely different personalities come from? These omnipresent folk melodies, scales and rhythms – in Tchaikovsky’s case filtered through the Western sensibility, and raw, awkward and painfully real in Mussorgsky’s works? Perhaps this is because every child of 19th-century Russian landowners would take their first steps and learn about the world under the care of a nanny – usually an illiterate serf woman who would put the young masters to sleep, singing folk lullabies, and when they were bad, frighten them with monsters from Russian fairy tales. No one referred to this tradition with more emotion and understanding than Mussorgsky: at first directly, in the song cycle The Nursery (1868–71) set to his own lyrics, and then in a less direct manner – identifying the nanny with the ominous figure of Death – in the Songs and Dances of Death to poems by Arseny Golenishchev-Kutuzov (1875–77). Both these cycles, as well as the songs from the Sunless cycle, written between them, make up a striking picture of human life – from the cradle to the grave. Both represent a “vocal theatre” of sorts, with a masterful dramatic structure and stage directions provided by the composer. The Nursery begins with a short scene in which the little boy Mishenka is begging his nanny for a fairy tale. He then proceeds to mess with her knitting, for which she makes him stand in the corner; he finds a large beetle and, with a flushed face, tells the nanny his adventure; for a while he lets a little girl lulling her doll to sleep take his place, only to come back on a wooden horse and prevent the cat from hunting the canary; he then daydreams a bit, and finally quarrels with his sister. In the Songs and Dances the nanny turns into Death: at first as a caring figure, rocking a dying baby in her bony arms, then as a seductive lover, tempting a young woman to follow him into the underworld; then, cunning and deceitful, luring a drunk freezing in the snow with a vision of fields filled with flowers, and finally, cruel and triumphant over the world, as a regiment commander leading his soldiers to die on the battlefield. Photograph of Mussorgsky, taken in 1880 or 1881, a few months before his death. ‚My music must be be an artistic reproduction of human speech,’ Mussorgsky himself wrote. In all the songs the musical material is condensed to the utmost; there are no empty digressions, each structure represents a particular emotion. The composer does not use long phrases but much shorter sections, at times consisting of just a few words, at other times framed by a single word or even a single vowel-exclamation. The accompaniment merges with the vocal line into an inseparable, organic whole. The metre changes all the time, the accents shift, the intonation fluctuates like in a real-life exchange in a conversation between people. A masterful performance of Mussorgsky’s songs requires immaculate voice projection, perfect enunciation, and ability to handle dynamics and colouring, not to mention great acting skills. It is no wonder that artists, both during recitals as well as on records, frequently intersperse this dense narrative with Tchaikovsky’s songs – with their equally obvious references to folklore distilled in the composer’s retort down to a drawing-room romance – a uniquely Russian answer to the German art song. It is also a one singing actor show, only slightly gentler, more organized, devoid of any features of cruel grotesque, shying away from realistic representation. Which does not mean that underneath this mask of refinement no muted emotions are brewing. Finally, it would be difficult to find a better song to bring a recital programme to a close than Where art Thou, Little Star?, written by Mussorgsky when he was barely eighteen – on the one hand, a still stanzaic piece based on the strict rules of functional harmony, and on the other a work heralding the innovation of the composer’s future cycles with its complicated chromatics, bitter fatality of the lyrics and despair lurking among the notes. A melancholic cosmopolitan and a descendant of Russian boyars drinking himself into a stupor in sleazy joints. At first glance, they had nothing in common. In reality, they shared a longing for a lost childhood and a caring nanny who imperceptibly, too early for both of them, turned into death.